We run a closed cattery, which means we do not bring cats on to our premises. We do not provide a stud service. Our kittens go to approved homes only. We reserve the right to choose not to let a kitten go to a place and environment we do not think will be in the best interests of that kitten. ALL kittens are born and raised within our home and they have contact with our other pet Raggies and our dogs. Once weaned they are raised exclusively on quality dry kitten biscuits. Each kitten comes with an Information Booklet, a 4 generation pedigree, NZCF Registration papers, six weeks free health insurance cover, a Vet Health Certificate and a complimentary kitten pack. Occasionally entire kittens are sold to approved registered breeders within New Zealand or World Wide. 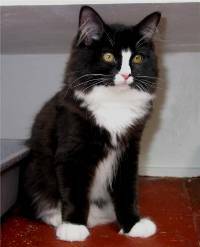 a Seal Mitted male pointed cat. In this litter were two self coloured and two pointed kittens. 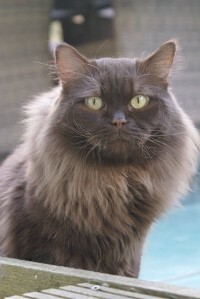 also known as Toni, a Chocolate Point female and Kyoto, a Seal Mitted male. and Gueber and Mitts were registered with the same body as experimental Persians. 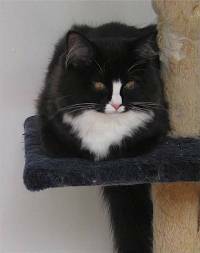 When Gueber was mated with Raggedy Ann Toy Ling, the offspring of Tiki and Kyoto, the resulting kitten was Raggedy Ann Adam, born 11th June, 1967 and he was also registered with NCFA as an experimental Persian. For some years the pointed Ragdolls were the favoured ones and the self coloureds were ignored. 'controversial' even to this day. They are often seen listed on pedigrees from other registries as "Foundation". accepted and many breeders recognise their valuable genetic contribution to the breed. because the pointing gene may then be lost from that gene pool. in contrast to pointed Ragdolls, which have points which are darker than the body colour. to develop to shades of green, blue-green, copper or gold as they mature. Sepias and Minks. This gene, originally from the Burmese breed, alters the basic colour of pointed Ragdolls. 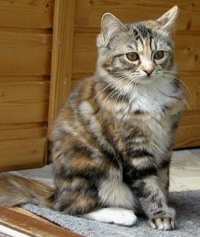 has a lighter shade than their points but not as light as in a normal pointed cat of the same basic colour. single copy of the sepia pointing gene are Minks. kittens when mated to a normal colour pointed Ragdoll. but want to promote the Self coloured Ragdolls. We now have had many litters of self coloured Ragdolls. For our self coloured kittens we have added "Tu" to their pedigree name. Raggedy Ann Adam and Raggedy Ann Tiki's sibling, Gueber. We are expecting our first litter of Mink Ragdoll kittens early in 2017.